The Olympus OM-D E-M5 Mark II is a high-quality, compact ILC made to be easy enough for anyone to use. High-quality still images combined with the easy-to-use video features mean this is the only camera you will need. Read more in our Full Conclusion. Meet the Olympus OM-D E-M5 Mark II, an advanced interchangeable lens camera that's not only compact, dustproof, and splashproof, but also stuffed with new technologies to capture unparalleled high resolution still images and HD videos. At the core of the OM-D E-M5 Mark II we have a redesigned 16MP Live-MOS Micro Four Thirds image sensor and the Olympus TruePick VII image processor. Together, they control the 81-point Fast AF and Small Target AF Systems, allow for up to 10fps RAW image capture, and enable Silent Mode, a full-time 1/16000 second electronic shutter that eliminates mechanical shutter noise (the mechanical shutter runs at 1/8000 second). Next, let's talk about the Mark II's new in-body 5-axis VCM image stabilization system. Olympus calls it the "world's most sophisticated image stabilization". It works by shifting the 16MP image sensor "horizontally, vertically and on the X (pitch), Y (yaw) and Z (roll) axes in order to provide 5.0 EV steps of compensation performance." In real world terms, this means shooting still images at shutter speeds as low as 1/4-second without the need for a tripod. To preview the 5-axis I.S., simply depress the shutter button halfway; you'll see the results "live" via the 3.0-inch Vari-angle Touchscreen display (1.04M-dot) or 2.36M-dot electronic viewfinder. 16-megapixels not enough for you? Try the new 40MP High-Resolution Shot Mode. Simply place the OM-D E-M5 Mark II on a tripod and let it take eight sequential images over a one-second period, which are then stitched together into a 40M JPEG file, a 64M RAW (ORF) file or a 16M RAW (ORI) file. However, if you opt for the ORF version, please note you'll need a special plug-in for Photoshop CS4 or later to process them. The Mark II also boasts Adaptive Brightness Technology (which "automatically adjusts the backlight brightness in accordance with environmental lighting"), LV Boost II (helps you shoot starscapes), and Creative Control (control color, tone, focus, and aspect ratio). Another cool features is Live Composition Mode, which is accessible in Manual Mode only, by scrolling the shutter speed past "Bulb". Live Composition acts similar to Bulb mode in that you can use it to take night photographs of things like star trails. But Live Composition takes out all of the guess work, and it shows you how your image is going to look when finished LIVE on screen. Basically, it's a much more user-friend version of Bulb mode that works by only adding information to the image if it is A) new or B) moving. Anything that remains still is not double exposed. In OM-D Movie Capture Mode, the Mark II records Full 1080p HD videos at up to 60p and up to 70 Mbps (at 30p). It also supports 50p, 50p, 30p (2.9.97p), 25p, and 24p. There's also an integrated microphone jack, and control options for a headphone jack (requires the optional HLD-8G External Grip). The 3.0" touchscreen allows you adjust AF-point, exposure, electronic zoom, microphone sensitivity, headphone volume and add in art effects on the fly. Need more zoom, but don't want to loose image quality? Try Movie Tele-converter. There's also support for time code, an HDMI output for use with an external monitor, and numerous Art Filters. These include Pop Art, Soft Focus, Pale and Light Color, Light Tone, Grainy Film, Pin Hole, Diorama, Cross Process, Gentle Sepia, Dramatic Tone, Key Line and Watercolor. Lastly, the OM-D E-M5 Mark II includes a bundled, tilting and swivelling flash (also dustproof and splashproof) as well as integrated Wi-Fi. The wireless features work in conjunction with the Olympus Image Share App (for Android & iOS tablets and smartphones) as well as Olympus Capture Suport (for Mac and PCs). Image Share allows users to apply Art Filters, or start/stop movie recordings, while Capture Support allows you to fully, and remotely, control the camera. We've hand one day with the OM-D E-M5 Mark II and there are so many great features to learn about, we've only begun to scratch the surface. We'll be posting more pictures on our Blog, Facebook and, of course, doing a much more in-depth Full Review shortly. For now, my first impressions of the Mark II is that it's a terrific camera. Retro designed (in the silver finish, at least) but loaded with technology. The camera is fast, highly accurate, and image quality only improves with better glass (we currently have access to two Pro Series F/2.8 zoom lenses). I was also surprised by how much I enjoyed trying a few of the Art Filters. Sure, the pros don't need that stuff, but filters like Dramatic can turn your pictures into ultra high resolution, over saturated art pieces that trump anything Instagram is putting out. Menu functions are easier to access than ever. Simply tap the OK button after start up to access tons of manual controls, adjustments, and settings from almost any mode. If that's not easy enough, there are six Function (Fn) buttons you can customize to easily adjust modes or color grading settings on the fly. I still have a little bit more to learn about the movie mode, but this camera shoots up to 60p in Full HD 1080. Native 60p means if you drop this footage into a lower 24p or 30p movie timeline (in editing software like Adobe Premier or Final Cut Pro), it'll play back in slow motion without any need for processing. There's also an option to watch the footage in slow motion right from the camera's LCD display. Speaking of the display, it tilts and swivels to make selfies easy, and it's responsive to touch commands, but there aren't that many touch options, aside from selecting focus (and select-focus-and-realease-shutter). I wonder if the interface should be more touch friendly? Also, the LCD is bright and accurate, but out in the direct sunlight, it's pretty hard to see, which is true for most displays. The killer feature (thus far) on the E-M5 Mark II, apart from all the bells and whistles, is the state-of-the-art 5-axis image stabilization. It helps with low light stills, and it's great for handheld video. Some people are saying you don't need "Steady Cam" with this, which is a little hyperbolic, but not kidding you for one second, this is the best in-camera stabilization I've ever experienced. If you put a little effort into trying to even out your steps (not bouncing while moving), this camera takes impossibly smooth video. It's fantastic. It's innovative. And for right now, it's the only camera that has it. (not even Olympus' flagship OM-D camera). Lastly, while this isn't a plus for the camera itself, there will be tons of available accessories. Battery packs. Grips. A flexible flash. Underwater housing. An external dot sight. The HLD-8G grip seems like a must have accessory, particularly if you have bigger hands (this camera is quiet compact) or if you need an external headphone jack. 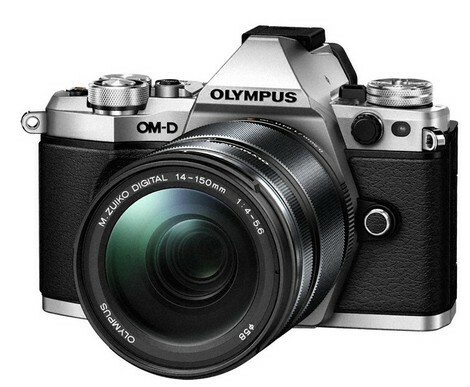 The Olympus OM-D E-M5 Mark II is available in black or silver with a $1,099.99 estimated street price. This is not a kit, and will only include the body. Kits may be available overseas. Also, there's going to be a limited edition "Titanium" color body. These images were taken on an Olympus-sponsored trip to Bermuda to show off the OM-D E-M5 Mark II. While the camera can capture RAW, these photos were captured as jpegs and compressed further for this Preview. We'll make sure to upload the full resolution images shortly. Finally, we have one Live Composite shot and one where a manually used a long shutter exposure (also in Manual Mode), but can you guess which one...? Give up? It's the first image on the water. Crazy how they produce almost identical images. The catch, though, is that Live Composite is much easier to do because you can plan when to start and stop the image based on moving objects, rather than on the length of time it takes to properly expose the entire frame (all the while, as you hope you guessed correctly). Keep your eyes open for the Full Review and more Sample Images.